The concepts, skills and techniques of photography can easily overwhelm beginners, and even many hobbyists and amateurs with some experience. Believe it or not, professional photographers don’t know all there is to know about photography. 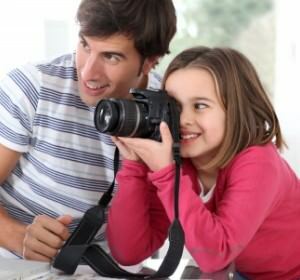 If you’re attracted to photography as a new hobby or you’re a hobbyist struggling to learn more, so your photos are better, then the best approach may be to become the teacher as well as the student. Lesson #1: Become familiar with a camera. A digital camera is a tool, a device, and you can’t expect to use it correctly and successfully unless you first understand its basic operation and how well it fits in your hands. If you haven’t yet purchased a camera, then you have the wonderful opportunity to rent the camera you would like to buy for a weekend. You’ll save time and money if you discover later that you bought the wrong camera for you. Whether you are planning to buy a camera or already have one, its “textbook” is the accompanying manual. The modern consumer seems to think that product manuals carry the Bubonic plague, but there is no better investment of your time to learn how your camera works. Even if you haven’t bought a camera yet, many manuals are available online, so you can read/scan a few to help you know your camera before you buy it. If you’re stumped by anything you read in the manual, then ask for help on the PhotographyTalk Forum, as there are sure to be fellow photographers with the same camera, and more experience with it. Once you’ve spent a reasonable amount of time with the manual, plan a photo session with the sole purpose of using most of the major functions. Don’t worry too much about the pictures you take; instead, focus mostly on locating the various buttons and controls, and then activating them to see what happens. It’s nearly impossible to enjoy photography or capture interesting and creative images until you know how to operate your camera. Lesson #2: Start with the most basic technical concept. Photography consists of many technical and artistic concepts. You’ll make yourself crazy if you try to learn too many of them too quickly. The one you should learn first is how the combination of shutter speed, aperture and ISO work together. Concentrate on each separately, and find the controls for all three. The bigger challenge is learning the relationship of one to the other and all three together. Again, there are articles on PhotographyTalk and videos in the Forum section that will help you. A number of PhotographyTalk vendor partners offer beginner online courses to understand exposure that are low cost and don’t require much of your time. No concept is more important to taking great pictures; and the sooner you learn it, the sooner you’ll be enjoying yourself and receiving praise from others. Lesson #3: Learn the most basic creative concept. Photography, like painting, is an art form that must occur within the physical limits of the frame (or canvas); therefore, you must also understand the concept of composition. It is simply how you position yourself and your camera to create an interesting view of a scene or subject, or a group of subjects/objects within the limits. Both photography and painting have many common compositional guidelines—the rule of thirds, the use of lines, light and color balance, contrast, etc.—that are made much easier to understand when you attend a basic compositional course, even one in painting. PhotographyTalk’s How To Articles Section is filled with additional aids as well as videos found in the Forum. Lesson #4: Don't be afraid to hit the books. The world of photography offers an enormous number of books on virtually every subject, topic, concept and technique. Many of them are available as e-books, so it’s easy to take that instruction with you on a cell phone or tablet during your photography sessions. Look for articles and other links on PhotographyTalk to some of the best photography books because we’ve already screened many as being right for you. Lesson #5: Put it into practice. It may seem to have taken too much time to reach the “fun” lesson, but if you’ve prepared yourself properly, then you’re ready to use the controls on your camera, photography techniques and creative concepts to start taking pictures. Like many hobbies, athletics and creative endeavors, you advance and become better with practice. Simply put, a photographer photographs. Try to find time everyday to take pictures, even if it is only for a half hour. Ultimately, you’ll learn the most, and become a better photographer, by shooting thousands of pictures, making mistakes and asking more experienced photographers to help you overcome your mistakes. That is one of the primary values of PhotographyTalk’s Forum: the photographers you’ll find there are genuinely eager to help you, so make it the first place you go when you’re frustrated or feel challenged. How to Photography: It’s Supposed to Be Fun!